Modern architecture and latest building services engineering are the main advantages of this 5-story office building, which meets all criteria for sustained economic construction (DGNB). In addition to our already excellent location this new building will exemplify the high value of building equipment, including a structured KAT 7 network, KNX Bussystem, access control, intrusion detection system, air conditioning, air heat pump. Darmstadt is centrally located in the Rhein-Main region and has perfect traffic connections to highways and freeways. The connection to the "Darmstädter Kreuz" of the A5/A67 offers a smooth connection to the surrounding Frankfurt, Wiesbaden, Mainz und Mannheim metropolis. It is 22 km from the airport Frankfurt via the 8 lane highway A5. The main station has connections to Stuttgart-Heidelberg-Frankfurt (via ICE) and to Mannheim-Frankfurt (via IC). 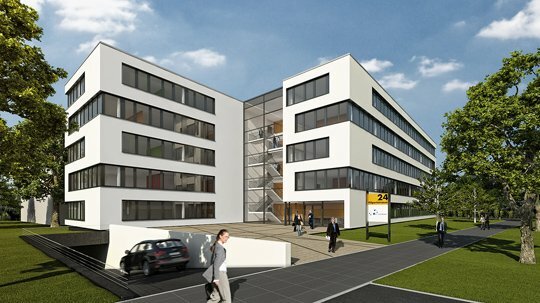 The property is located in the Bürostadt West near the TZ Rhein-Main (Technology centre of the Deutsche Telekom). The Bürostadt West is located on both sides of the B26 between the Autobahnkreuz Darmstadt and downtown. The connection to the A5 and A/67 are within a mere 1500 meters. A bus station in front of the property connects the Hilpert Office with the main station in 7 minutes. There are regional trains, long-distance and ICE trains to Frankfurt which head take you everywhere. 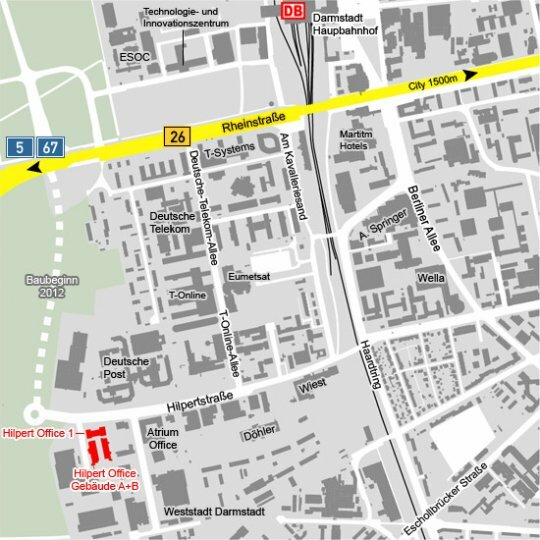 On the route from Hilpert Office to the main station you will pass two Maritim Hotels.